It’s been a busy couple of months at Paddington Library! 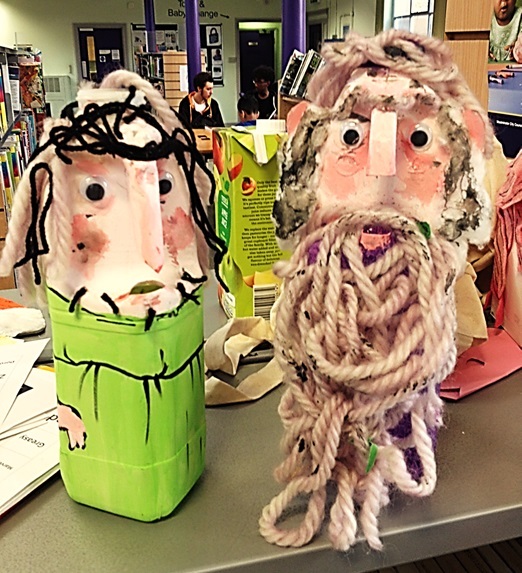 No sooner had the flurry of children’s activities for this year’s Summer Reading Challenge come to an end than it was time for all the many and varied regular events to build up again. But that was not all – there was the Paddington Book Festival to come, followed closely by Silver Sunday. The Paddington Book Festival is an annual festival which has been has been running for several years. 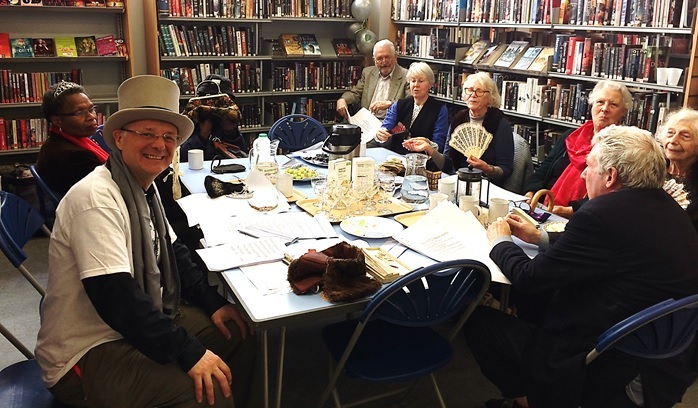 Instigated and supported by a local Westminster Councillor, it is a series of book and reading-related events in September with the aim of engaging the local community in cultural and literary activity. 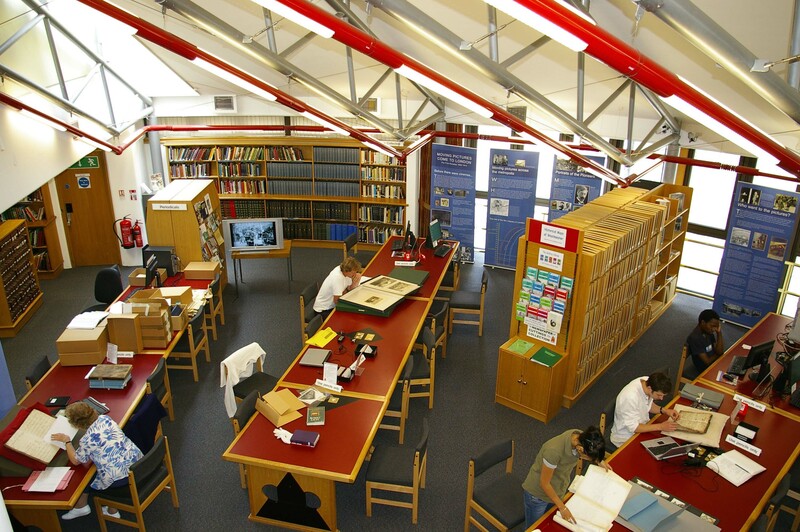 Events do not take place solely in Paddington Library, however – they are spread across four libraries in the north of the Borough. 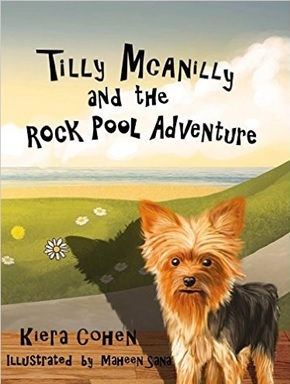 Queens Park Library hosted Kiera Cohen who introduced her début children’s book Tilly McAnilly and the Rock Pool Adventure. Maida Vale Library hosted a splendiferous party to celebrate the centenary of the birth of Roald Dahl. 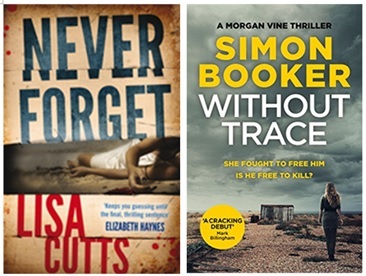 Paddington Library hosted two events devoted to crime fiction: Elizabeth Flynn spoke about her novels which feature detective Inspector Angela Costello and there was a well attended panel talk given by authors Lisa Cutts and Simon Booker. 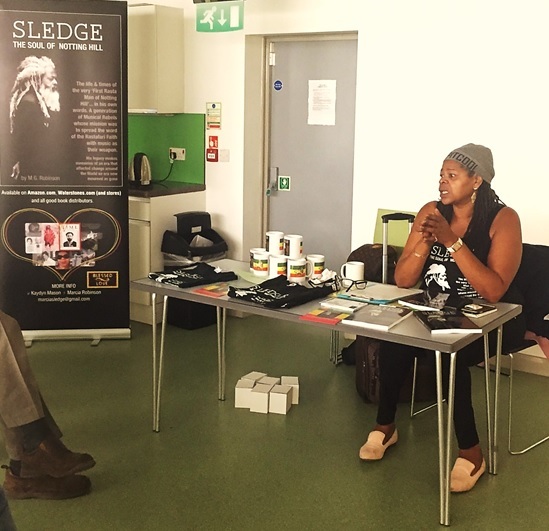 Finally author MG Robinson visited Church Street Library to discuss her book Sledge: the Soul of Notting Hill, about the life and times of her father, the very first ‘Rasta man of Notting Hill’. The first weekend in October is now the established date for Silver Sunday, an annual day celebrating older people. We have already reported on a couple of the other Silver Sunday events that took place in Westminster Libraries, but there were many more both on the day itself and the weeks before and after, including those at Paddington Library: For the first time this year, Owen arranged and led bespoke IT workshops on Online Family History and Online Shopping. Lots of people enjoyed chair yoga with Tim or took part in a play reading led by Kate and Laurence from Oscar Wilde’s ‘An Ideal Husband’. Additonal taster IT sessions completed the programme. Will we be having a rest now? Of course not! Take a look at our events page or follow @WCCLibraries on Twitter to find out what’s next (tip: career networking, Black History Month and spooky Halloween half-term events are on the agenda so far). Great news everyone: the 1939 Register is now available when you use findmypast in the library – without the need to pay! 1939 was the year that Great Britain entered the Second World War. At the same time the government was already almost prepared for the next Census, due to take place in 1941. The worry of the impending crisis and this coincidence meant that they chose to create a national register on 29 September 1939. 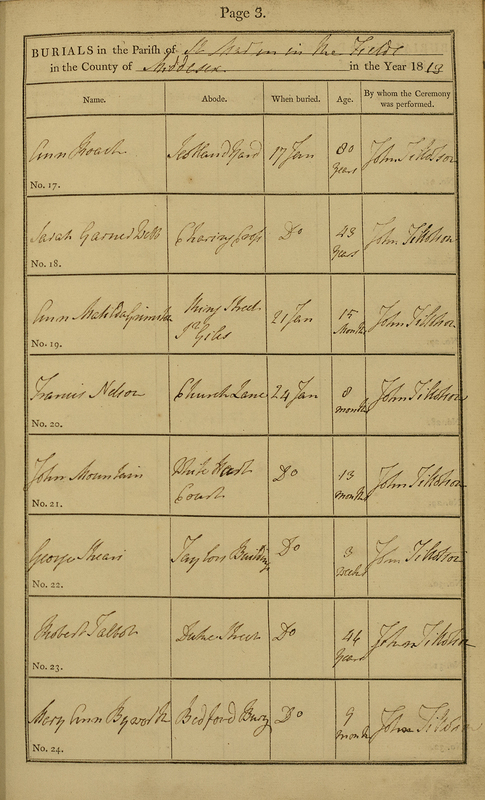 This Register was similar to a Census, but differed in a few ways. Most obviously, the date is not a Census date – the Census is held every ten years, the previous ones in the 20th century being 1911, 1921 and 1931. It was also not called a census but a register. The Register holds the details of 41 million people, each of whom would have been issued with an ID card at a time of rationing etc. The details they had to submit to get this ID card, including name, address, marital status, occupation and date of birth are held on this register. The register is described by Find My Past as “one of the most important documents in 20th century Britain”. Having been scanned by findmypast it was made available on a pay per view basis in September 2015. However, it is not until now that it has become available to general subscribers, and this of course includes library users in Westminster. In some ways we are very privileged to be able to view the register. If it were a Census we would be unable to view the entries until 100 years after it took place. The 1921 Census will be the next Census available after the 1911 Census, this will not be viewable until 2021 at least. 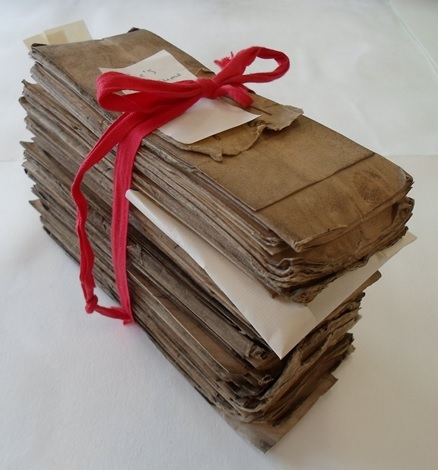 Nevertheless, findmypast has put in some regulations as to which records are available. The main limit is that you will be unable to view ‘records of people younger than 100 and still alive, or who died after 1991’; it is possible to challenge this on a case by case basis. More information is available on the Find My Past site. You can use findmypast in every Westminster Library and at Westminster City Archives, along with Ancestry. These are just two of the many amazing online resources available to readers to help with their family history research and any other studies and research they wish to undertake. I’m Cecilia and work as an Archives and Local Studies Assistant at the City of Westminster Archives Centre in St Ann’s Street. My daily work is varied and is split between staffing the reception desk on the ground floor and the enquiry desk in the search room on the fifth floor, plus some time off the desk for back office duties. Reception duties include looking after the meeting room we hire out, the Express Library and the small local history bookshop. I register all new archives and library visitors, answer all the incoming calls for the building, monitoring bookings and statistics etc. 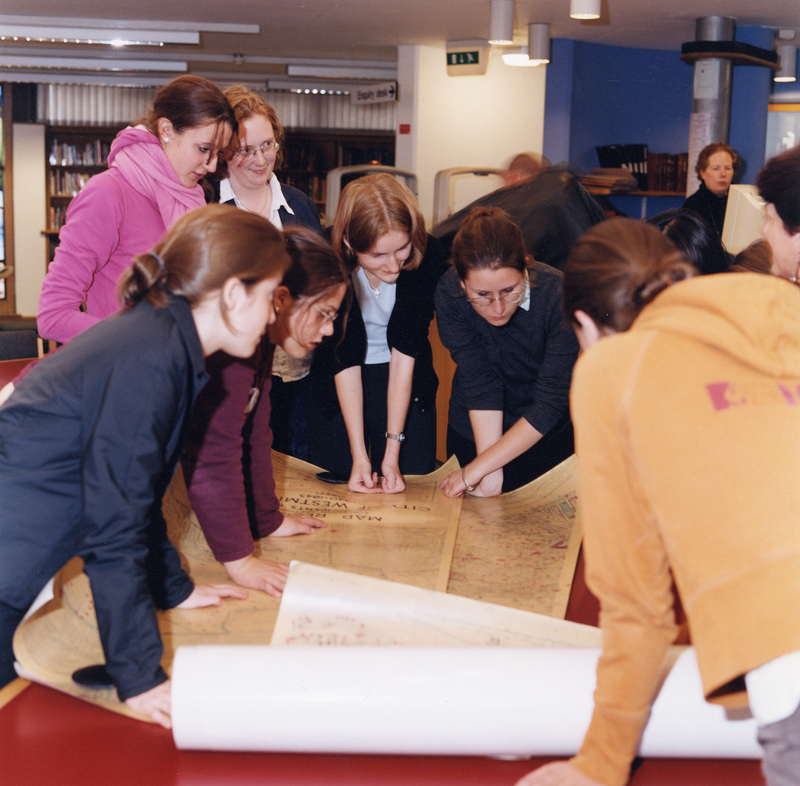 Work in the search room means helping archives users find appropriate sources for their research. 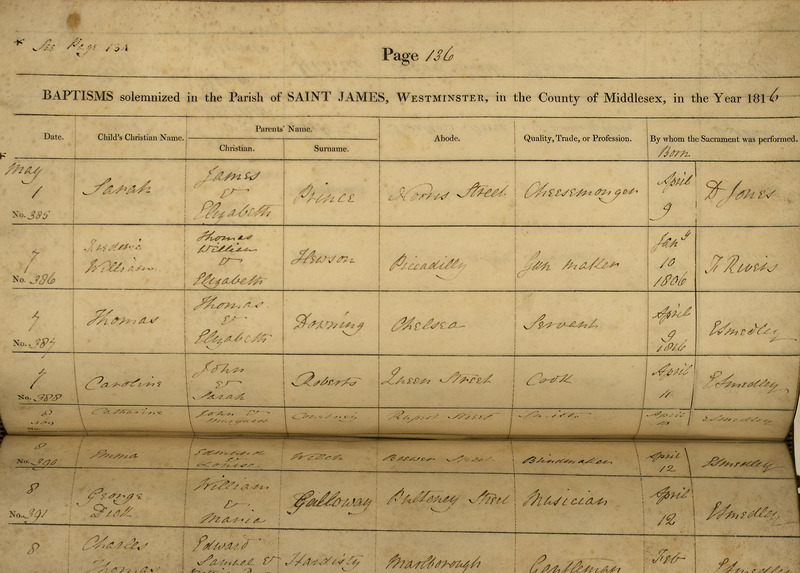 Most of our users are looking for their family history and will look at the parish registers, census records, historical maps, prints and photos and electoral registers for Westminster. They can also access many more records for a wider area through the libraries subscription to family history websites such as Ancestry and Findmypast. 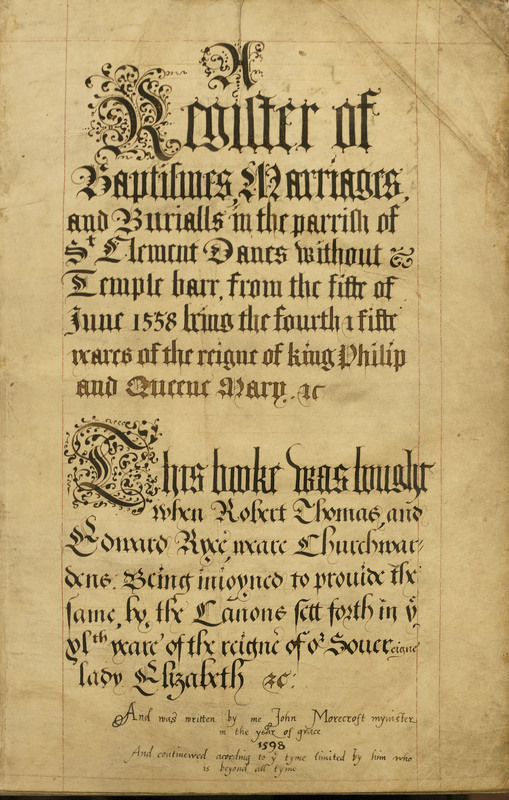 Many of Westminster’s parish registers and early rate books are available to search by name and view on Findmypast. 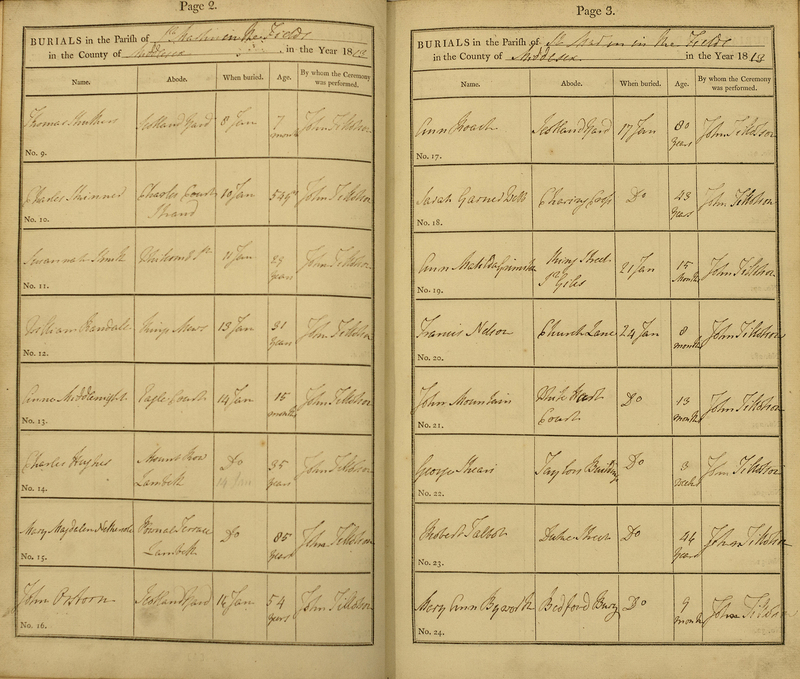 They are also available on microfilm in the search room as are other parish records, local newspapers etc. Other users are looking at building history and use our large collection of council drainage/architectural plans. All original and unique records are kept in our strong rooms and are available by request slips. Descriptions and finding numbers can be found by searching our online catalogue WESTCAT or by using one of our finding aids in the searchroom, such as the print and photo card index or one of the printed volumes of indexes. 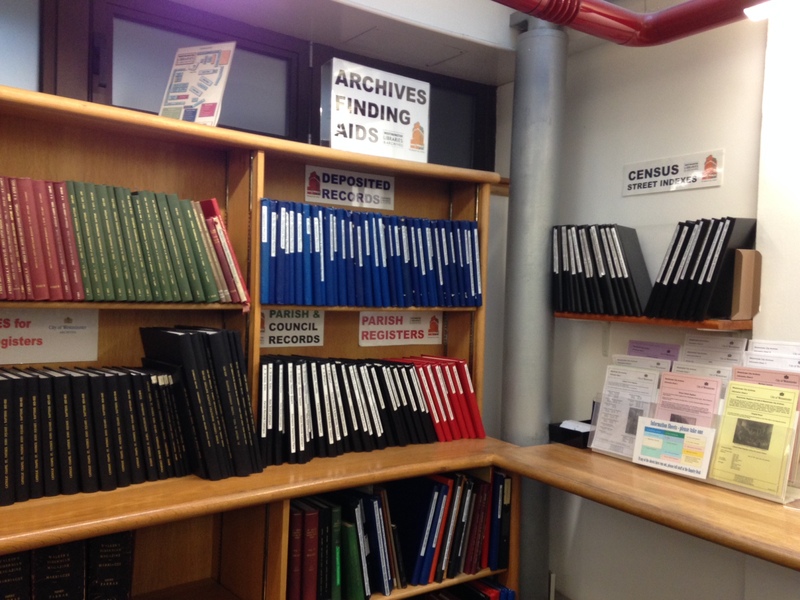 On the Archives website there a wealth of information to help, for example our Information Sheets found under Family History and a guide to the General Register Office indexes. Most of these records are only available to view in person by visiting us. We also have a large collection of printed material, such as reference books, pamphlets, periodicals and London directories, which have listings of trades and streets etc. One of the most interesting aspects of the job is answering the email enquiries we receive – I often learn something new about the history of Westminster while answering. It’s great to have all this information collected in one place. Quiz time – what’s the oldest British newspaper still being published? While you’re thinking about it, I will tell you that the oldest surviving paper in the world is Post-Och Inrikes Tidningar, or ‘Post and Domestic Times’, the official government newspaper of Sweden, founded in 1645. It took 20 years for the British to catch on that this might be a good idea but on 7 November 1665, the London Gazette was born. The London Gazette was first called the Oxford Gazette, since Charles II and his ministers had wisely left London to avoid the Great Plague. 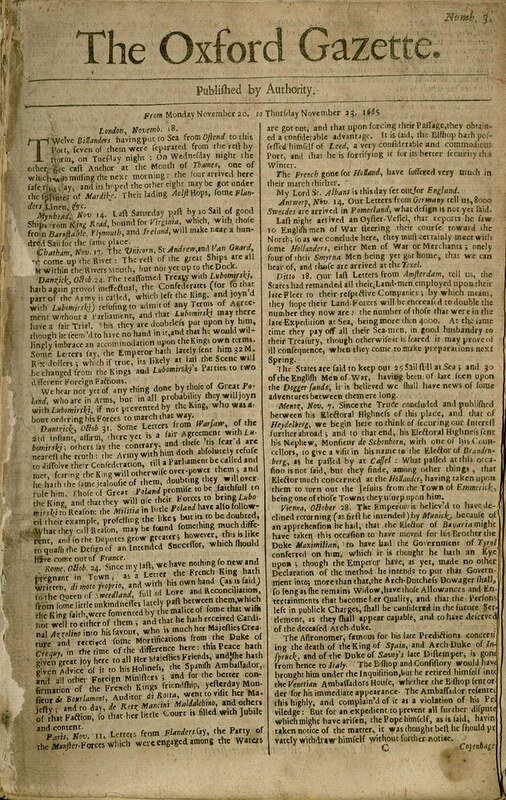 To be honest, the first issue, as described by the diarist Samuel Pepys sounds a bit dull: ‘very pretty, full of newes, and no folly in it’, but things soon hotted up (literally) when the Gazette returned to London in issue 24, something the journalists may have regretted when they had to cover the ‘sad and lamentable accident of Fire lately happened in the City of London’ in issue 85. You can read up on the history of the Gazette, and jolly fascinating it is too. But it’s not for news coverage that the paper is best known but as the official journal of record of the British government. It is published daily online and covers such matters as public appointments, military honours, bankruptcy, wills and probate. This makes it a fascinating source for family history… and just general nosiness! You can search it to see if anyone you know has had an army promotion (see if Great Uncle Ernie’s claim to have become a Major while doing National Service was true), become insolvent or been given an honour. 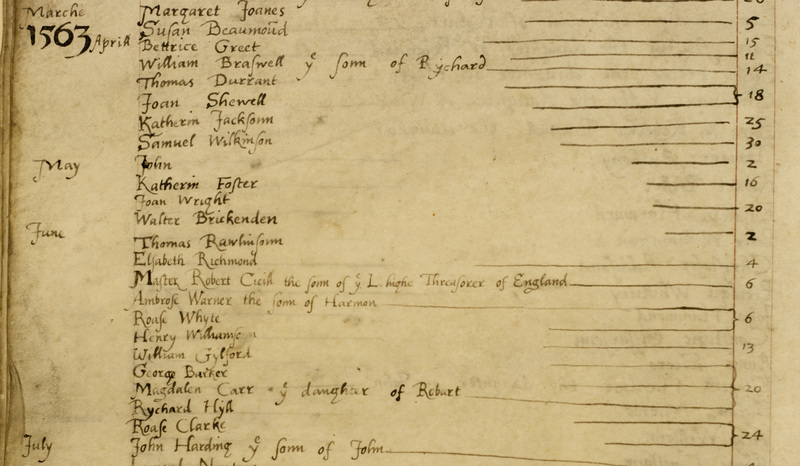 With 350 years of records, it’s a treasure trove for genealogists. The London Gazette is available free online, but for many newspapers you need a subscription to access their full archives. However, don’t worry – we do that bit so you don’t have to! Just go to our Online Resources page and scroll down to see what we have. Remember to have your Westminster library card with if you are on your home computer as you’ll need it to log in. Most of the titles are self-explanatory but there are some gems you need to hunt for. ukpressonline is the archive of the Daily Mirror and Daily Express, but the package includes some other oddities you might not have spotted. In the World War II collection (which actually covers the period 1933 – 1945) you can find not just the Express and Mirror but a whole range of other papers too. While we certainly wouldn’t endorse the politics of Blackshirt or Fascist Week, there’s no doubt that they make fascinating reading and shed light on a very dark period of British history. For some political balance, there’s also the (socialist) Daily Worker or if you want to see a different angle, have a look at the (Methodist) Watchman or (Anglican) Church Times. If your taste runs to the rather more scholarly you might want to look at the International Index to Music Periodicals and International Index to the Performing Arts. Both do what they say on the tin – they are searchable databases of over a thousand publications covering the full range of music, stage and screen and endlessly fascinating to anyone with an interest in the arts. But if what you want to do is just read a newspaper, we have LibraryPressDisplay. On the left hand side of the display, pick a country and see what’s available. If you choose the United Kingdom you can browse through the latest issues of over a hundred newspapers and magazines. If you’re more interested in what’s happening on the other side of the Channel, there’s about the same amount of French and German papers though Finland is only represented by 16 titles and Bulgaria a mere five. Whichever part of the world you’re looking for, there’s bound to be a newspaper – there are 25 Lebanese periodicals, all available on the day of publication. So whether you’re researching your travels or feeling a little homesick, have a look and see what you can find. You may even see your own hometown paper. 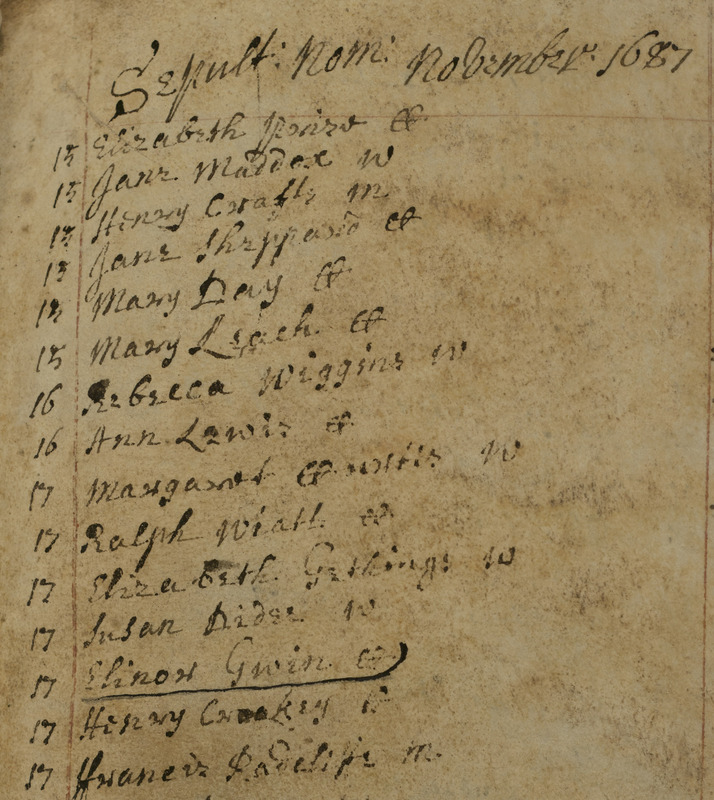 One of the delights of my job has been collating the various indexing projects carried out by our team of Archives volunteers, involving the collections of parish registers and records, and in particular the Poor Law Settlement Examinations. These provide a wealth of detail about people’s names and families, occupations and places of origin – all extremely valuable to family historians. But along the way, I have noted down some of the weird and wonderful names that appear in the records. Most people used a very limited number of conventional names – Anne, Mary/Maria, Jane, Elizabeth and Sarah for women, and John, William, Thomas, Henry and George, for men, with spikes in usage in line with royal names. Some oddities might be transcription errors – spelling wasn’t fixed and the parish clerks may have just written down what they heard, eg Fidusha for Fiducia, Pellaja for Pellagia or Easter for Esther. But is Mordecia Jones an error for Mordecai, or an early appearance of Morticia? There are some common abbreviations: Wm, Danl, Jno, Chas, Thos, and the less usual Xpfer and Xian for Christopher and Christian – the X and P are the Greek letters Chi Rho, but there are less usual abbreviations that can be mistaken for weird names in their own right, eg Cors – Cornelius, Fras – Francis/Frances, Sush – Susannah, Hart – Harriet if for a girl, Hanh – Hannah etc. Why do people choose particular names for their children? We are used to celebrities doing this (Zowie Bowie, Nolan Bolan, North West etc), but it is amusing to know that throughout history ordinary people have also done so. Sometimes the names are inherited through the family, but why would any parent call their child Stamp Brooksbank? Or Freelove Picket? Or Wharton Pigg Nind? Believe me, they really did. Foundlings – babies abandoned on church steps or in the street – were named by parish officers, and were usually given a biblical or religious name, often taking the name of the church or street as their surname. For instance a baby girl picked up on the steps of St Martin-in-the-Fields might be called Mary Martin, or a boy found up in Curzon Street might be called John Curzon. There is also the tradition of giving the eldest son his mother’s maiden name or a significant family name as a Christian name: Brereton Poynton Mitchell, Hindmass Sowerby, Gatley Jenkerson’, Urquhart Hay and Musgrave Hopwood. Many Non-conformist families chose biblical or religious names, virtues, or aspirations: Hepzibah Woolston, Jochabet Hart Crafer, Jehu Dunn, Shadrack Spurritt, Deodatus Collis, Constant Heart Barberson, Silence Sparrow, Virtue Cave, Paradise Smith, Record Lyons and Modesty Stannard, Although you wonder what was going on when the parents of Satisfaction Lewis, Repent Scarth, and Repentance Smith made their choice! Some people chose classical names: Iphiginia Morse; Julius Caesar Smith, Hercules Hill, Senacherib Sacris Stone. Sometimes you find fitting combinations: Humility Meeks, Comfort Lack, Makepeace Goodman, Rise Price, Noah Flood, Damsel Quiver. Amusing, unfortunate or just plain weird: Harmonious Budding, Amorous Hesse, Mrs Titt and Widow Fling, Peter Breast and Thomas Manhood, Tempus Hazard or Tempesthazard Carey, Canker Boswell, Dorkes Sharpe (perhaps this should be Dorcas? ), Err May, Brogden Poplet and Mr Gusheroons. 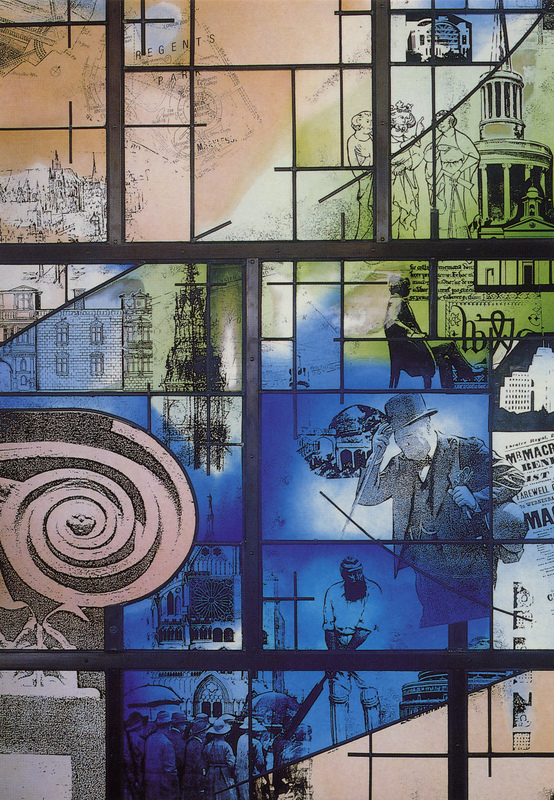 All the examples and illustrations above are from the 18th and 19th Centuries, and from the parishes of St Martin-in-the-Fields, St James, Piccadilly and St Clement Danes. What interesting names do you have in your family’s past? In the conservation studio of Westminster Archives Centre, our volunteers are embarking on a new preservation management project – cleaning thousands of records for St Margaret’s Parish. 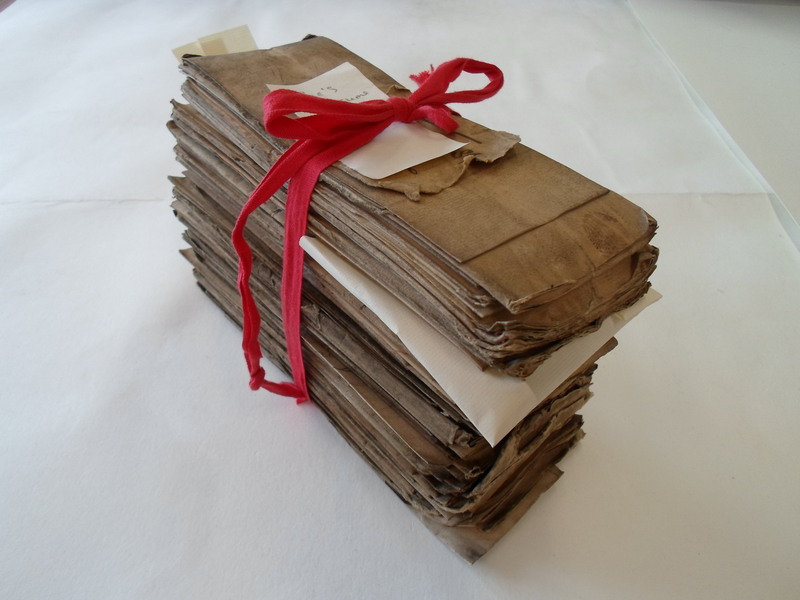 Bundle of St. Margaret’s Parish records (E3339/1801) waiting to be cleaned. Particularly vulnerable items are enclosed in archival rag paper for protection. At some point in their history, the records were stored in a smoky environment and the clear scent of wood smoke wafts from the boxes when they are opened. The residue from the smoke and other environmental grime can cause the paper to weaken. To slow down the process of degradation, our volunteers are surface cleaning each piece of correspondence using a smoke sponge and a soft haired brush. In addition to cleaning, the volunteers prepare enclosures for the records that are physically delicate. While cleaning the records the subjects, descriptions and people included have intrigued and fascinated our team. 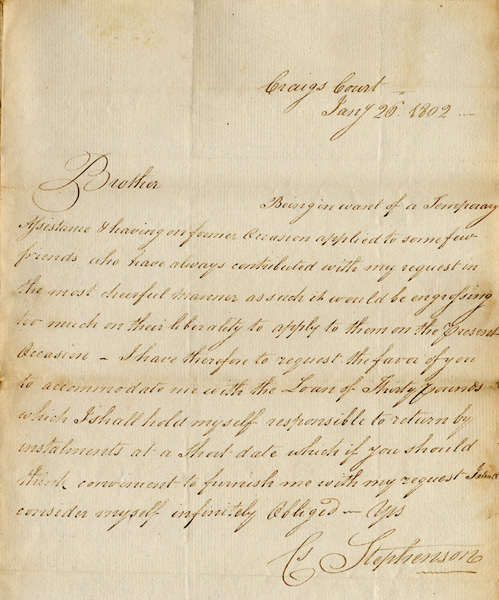 The correspondence includes requests for funds, complaints about a neighbour’s pigs affecting the price of real estate and requests for young people to be sent north to work in one of the first manufactories. Mr Stephenson was the Parish Warden for approximately 50 years and kept together his personal and business correspondence. It is the interrelated letters from family and friends that have specifically captivated volunteers and staff alike. 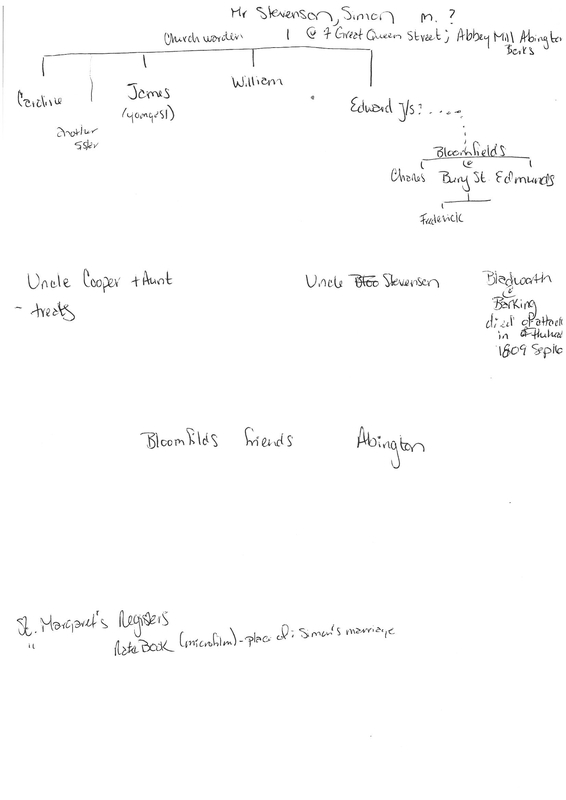 As we learn more about each family and friends, we are recording the information on an informal family tree. Informal Stephenson family tree being written to help volunteers keep track of the various people discussed in the correspondence. Your son arrived safe and well last night and delivered your letter for which I beg to thank you – the contents fully discharge the X Acct. 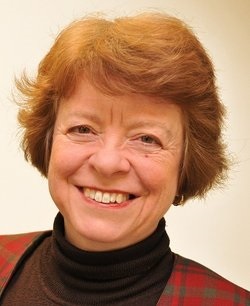 We are very happy to hear of Mrs Stephenson’s recovery, who I ? say, is beginning to wonder whether the next will be as large as Mrs. Jane Mildred. Mrs B is quite well and George is now beginning to improve in his health – hitherto he has been rather ailing. Pray make our kindest remembrance to the Abingtons etc. I was in hopes of seeing you but was prevented going to Town this Xmas – my ? friend is going on as I could wish and I think in due time will answer all your wishes about him. Mrs B. unites with me in best compl. To Yourself and Mrs. Stephenson & I am Dear Sir. I ought some time back to have acknowledged the rect. Of your valuable present of paper etc. but the prupose of ? and anxiety of mind must be my apology and I know your kindness too well to doubt your admitting it. When I say “anxiety of mind” I mean the hourly expectation of some of my family being taken with the fever which has (I may say) raged here for months past. Indeed, till this time, the town has never been free from it since last August – our fears are now nearly subsided as the Medical Gentleman assure me the danger is over. My ? folks, thank God, have all escaped but the caution we have used has been extreme. Our friend lost his 3 eldest children in a fortnight. Your Son has enjoyed a perfect state of health and continues to have the good report of his Masters, he desires Duty etc. 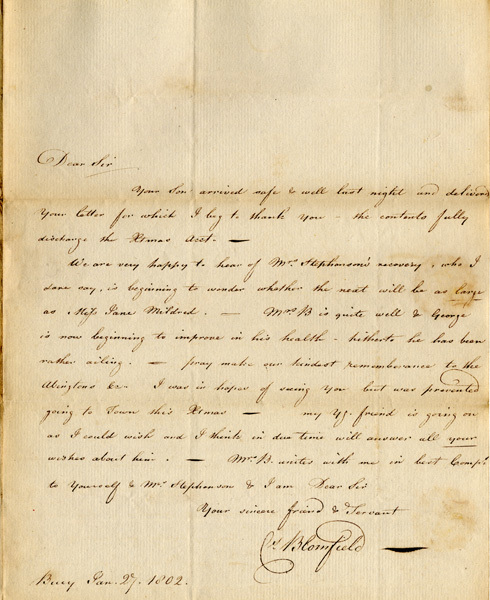 Mrs. B will offer my best regards to Mrs. Stephenson and yourself and I am dear Sir your much obliged friend and Serv. 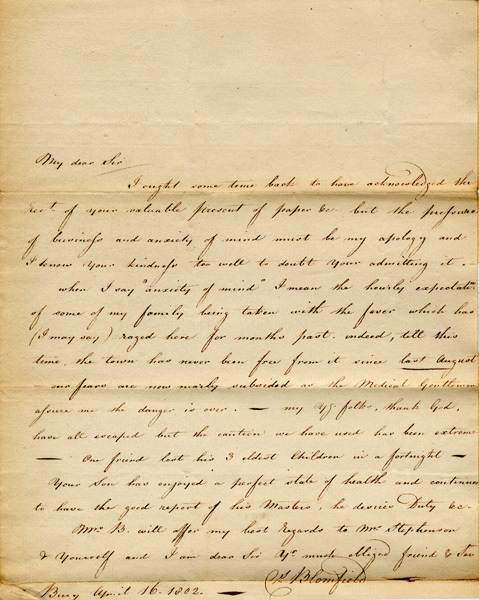 If you have enjoyed the three snippets of the lives of the Stephensons and Blomfields, we will be posting more of their correspondence on the Westminster Arhcives Facebook page in the coming weeks and months.